EU member states are expected to give their formal greenlight next week to the opening of negotiations on a free trade agreement (FTA) with Indonesia. A decision to this end is expected to be approved as an A-point (without discussion) by the Foreign Affairs Council on 20 June in Luxembourg. It will pave the way for the European Commission to lunch talks with Indonesia in the near future. This will bring to 21 the number of FTA negotiations the Commission is currently carrying on with trading blocks and third countries. Indonesia is a member of the Association of Southeast Asian Nations (ASEAN), with whom the EU launched free trade negotiations in 2007. But in 2009, after two years and seven rounds, the discussions were “paused.” Shortly afterwards the EU decided to continue FTA talks bilaterally with Singapore (talks launched in 2010) Malaysia (2010), Vietnam (2012), Thailand (2013) and the Philippines (2015). Based on the ‘Vision Group’ report of 2011, the EU and Indonesia launched talks on the scope of a future free trade agreement in 2012. They were completed in April 2015. Meanwhile, negotiations with Singapore were concluded in October 2014. A year later, in August 2015, the EU sealed an FTA deal with Vietnam. Negotiations with Malaysia reached stalemate in 2012 and talks with Thailand were formally suspended in 2014. Talks with the Philippines are ongoing, with the first negotiating round being held on 23-27 May this year. The Commission can carry out negotiations with Indonesia on the basis of the 2007 mandate for the FTA talks with ASEAN. 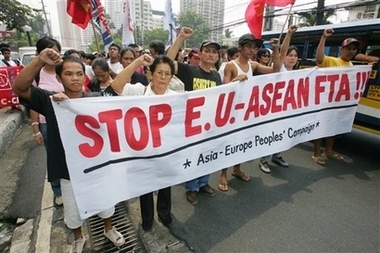 The ASEAN negotiating directives that set out the EU’s objectives and potential red lines were modified (an investment protection component was added) in July 2011 and extended in October 2013. The decision to launch negotiations with Indonesia in the form of a Presidency note to be adopted next week specifies the EU’s priorities and red lines inter alia in the area of maritime transport.